We are returning to the 5-star Cornelia Deluxe for a week of sun, golf and relaxation. With 5 rounds of golf included on the legendary Nick Faldo course, this holiday truly is a golfer’s Turkish delight. 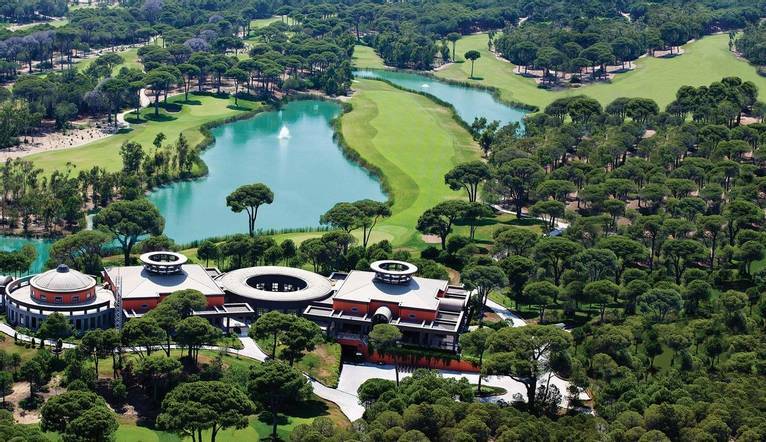 A perfect base for our golf week, the superb 5-star Cornelia Deluxe Resort is well-established as a firm favourite with UK golfers travelling to Turkey, and is regarded as one of the top golf resorts in Belek. We stay on an all-inclusive basis, which means we can make the most of fantastic facilities on offer and enjoy the service and hospitality for which the hotel is renowned. Situated a short shuttle ride away from the hotel, the 27-hole Cornelia Golf Club offers the possibility of playing three 9-hole combinations, the Faldo King, Queen and Prince, thus providing three different 18 hole challenges for golfers to tackle. The Cornelia Faldo Golf course, designed by Nick Faldo, is carved through a stunning pine forest, with a dramatic ridge of dunes running through the middle. It has all the components for a great round of golf: excellent layout, superb condition and in parts, a real test of golf. True to the Faldo ideal, there are a number of holes that require careful consideration, where the emphasis on course management is clear for all to see. On your free days, you can relax and enjoy the hotel’s facilities, or for the more energetic, try one of the other courses in Belek. This amazing region is fast becoming one of Europe’s leading golf destinations, with 14 superb courses dotted around the area’s indigenous pine forests benefiting from the region’s wonderful year-round climate. This beautifully designed hotel has direct access to the stunning sandy beach and offers guests a very high standard of accommodation. The facilities on offer include a buffet restaurant serving international cuisine, 3 bars (including a cocktail and a fresh fruit juice bar), 2 large free-form swimming pools connected via a series of waterfalls as well as a spa with separate Turkish hammam and wet area (including sauna, steam room, ice room, jet shower, Jacuzzi). There is also a bowling alley, billiards bar and occasional live entertainment. Free Wi-Fi is available throughout the hotel. The rooms are spacious and well-appointed, designed and furnished in bright modern colours, and feature air-conditioning, a TV, safe, Wi-Fi, hairdryer and balcony or terrace with side sea view. The transfer time from Antalya Airport to the hotel is approximately 35 minutes, depending on weather and traffic.